Remember back in the days when we used to keep our photos collected in beautiful photo albums? There was something special about flipping through the pages and cherish all the beautiful memories captured on photographic paper. Photography has evolved with the rest of technology. Nowadays it is much easier to snap with our smartphones or a digital camera and store all of our shots in organised digital files. Good news for old-school photography lovers. 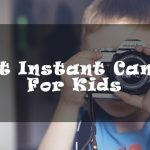 It is still possible to take an instant photo using an instant digital camera. We have done our research to help you finding the best instant digital camera available on the market that would suit your needs. Our brand of choice was Polaroid. We selected four digital cameras, tried them out and reviewed them. 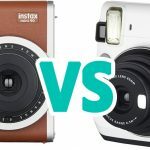 Read through the following instant camera reviews to help you making the right choice of purchase. 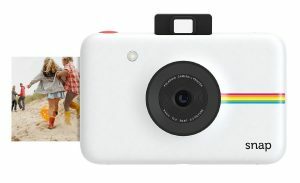 Polaroid Snap is the newest addition to the Polaroid instant cameras. It has a really cool minimalistic design and it fits in your pocket! It is a relatively cheap instant digital camera making it also an ideal gift. We loved this camera for its small size which makes it very easy to carry around and to handle. The retro look is quite cool as well. 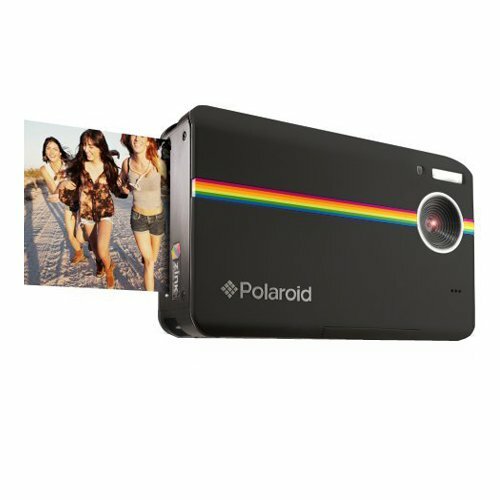 The Polaroid snap is very easy to use and it allows you to shoot in six different capture modes. We enjoyed trying them all out; we especially enjoyed the sepia tone because it gave our shots a nostalgic retro look. 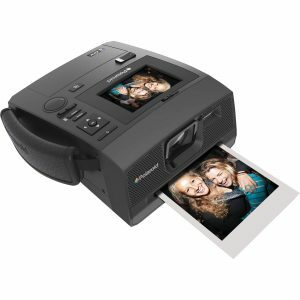 This camera is a combination of ZINK instant printer and a 10-megapixel digital camera so that you can print your photos instantly and also store photos in a memory card to save on your PC at a later stage. 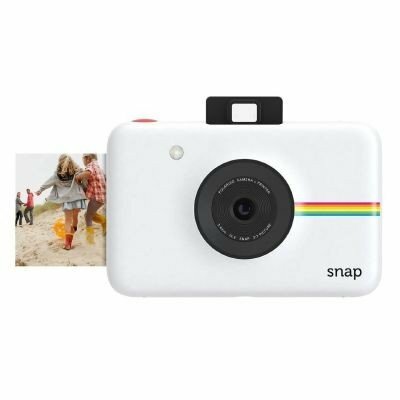 The Polaroid snap also features a memory card slot compatible with up to 32GB MicroSD and a USB socket to recharge the non-removable lithium ion battery. The camera can also be used in low light surroundings thanks to the LED flash function. Unfortunately, the Polaroid snap doesn’t have a screen and the optical viewfinder is not very reliable especially when taking close up shots. Another downside is the slow printing. It takes approximately one minute to print a full picture. On the bright side, you can already take a new shot while the camera is still printing the previous one. This small and compact digital instant camera by Polaroid is packed with fun features including a 6-power zoom lens and seven methods of white balancing. The camera has a built-in memory so you can save your photos to print or share later or you can choose to snap and print them right away. The camera also features HD video recording capability which is pretty amazing. You get a three in one device! The Polaroid Z2300 is undoubtedly a great instant digital camera. One of the best features is that you can decide which photo to print. A huge difference from instant cameras that shoot and print that same shot instantly. You kill two birds with a stone; no more people with closed eyes in your photos and you get to save your film as well. Another awesome point is the 2.5 inch LCD screen that allows you to view images before printing so that you can choose the ones you like best. The size of the screen is quite similar to the size of the printed picture, so what you see on screen is pretty much what you are going to get. You can also edit your photo or apply one of the many featured filters before printing it. We thought this was a very cool bonus. The quality of the prints is pretty incredible, despite being a little grainy sometimes. This, however, it depends on the snap you took. This Instant digital camera is not on the cheap side, but if you consider it does actually have an integrated printer and a rechargeable lithium battery, then the price is totally worth it. On the other hand, the film is really cheap so it compensates for the price of the camera. One downside is that the photo print out is quite small. Some parts of the subjects are lost and some details might appear blurry even if they looked perfect on screen. It also seems like the quality of the videos is not really HD even if the camera shoots HD videos. The quality appears a little grainy. This instant digital camera is an Instagram logo inspired device able to instantly print 2 by 3-inch photos or share them via Wi-Fi or Bluetooth. It has an impressive 14-megapixels front camera and a 2-megapixels selfie camera. 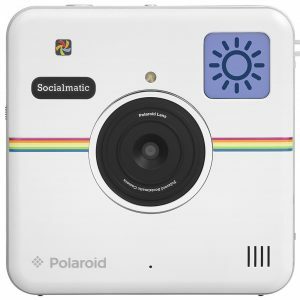 The Polaroid Socialmatic features an Android operating system that turns it into a powerful personal computer. It also has a built-in GPS, Wi-Fi and Bluetooth connectivity which allow for photo geo-tagging, remote printing and QR code feature. This funky camera with printer produces vibrant, smudge proof and water resistant 2 x 3 inches prints with a sticky back to stick them wherever you like. The camera is easy to use even if you are not very tech savvy. It is easy to frame up shots using the touchscreen and the photo gets printed in less than a minute. 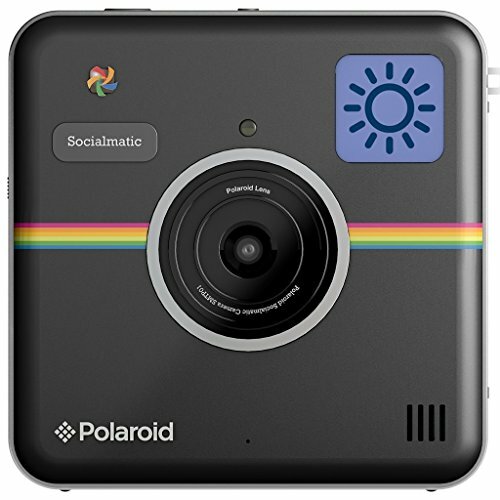 All in all the Polaroid Socialmatic presents all features you need to snap photos and post them on your favourite Social Media right away. One of the downsides we found is that the rechargeable battery does not seem to last very long. 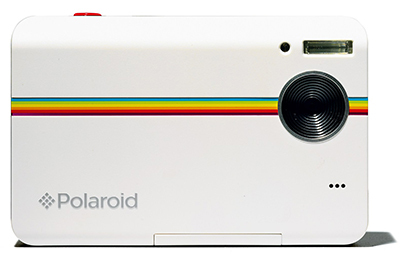 The Polaroid Z340 puts together a digital camera with integrated 3 x 4-Inches digital camera printer to create something that looks like a classic Polaroid for the 21st Century. The camera has a simple all black design with unfortunately a very small LCD screen that you can only flip up in one direction. The lens is also quite small, so if you shoot in a low light environment we recommend using the built-in flash. Your pictures will come out much better exposed. The camera features a number of staggering effects that can be applied to your pictures, including ten different kinds of borders. You can really be creative by choosing different shooting modes such as fish-eye or soft skin just to name a few. We enjoyed experimenting with the different ambience colours like sepia or vintage Polaroid. Shooting with this camera can really be quite fun. The downside is that the battery does not last very long; it only allows you to print about 25 images. The only way to check the battery life is to turn the camera on. In addition to this, the camera only holds 10 sheets of paper at the time, so you will have to carry extra packs of paper with you. Be prepared to wait a bit of time for your photo to be printed as the printing process is quite slow. Not as slow as the original Polaroid, of course, but slow in compare to other instant digital cameras. The Polaroid Z340 is not compact so if you are looking for something that you can easily fit in your pocket, it might not be the right choice for you. All in all, we enjoyed this camera. It is excellent if you are a retro lover and if you want to have a generous amount of different features to play with. 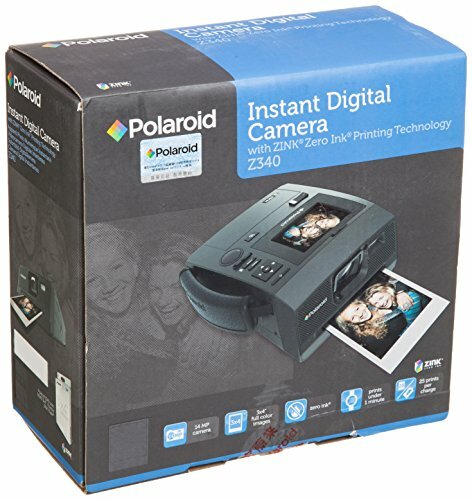 After having tried these four instant digital cameras, we spent some time evaluating all the pros and cons and we decided that the best one for us was the Polaroid Z2300 10MP Digital Instant Print Camera. It just ticked all the boxes for what we needed and what we were looking for. However, what is good for us might not be good for you. We all have different requirements and needs even when it comes down to having fun. 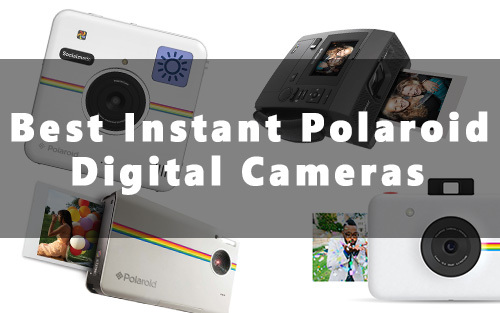 We hope that this easy guide will be useful to you and that after reading our instant digital Polaroid camera reviews you will be able to choose the perfect device that is most suitable for your needs.